A good cup of joe and a good cupcake will do wonders for the soul. Trust me. In New York— Manhattan specifically— I am, at any given moment, within a 45-second walk from a cupcake selling establishment. And this is ok with me. It’s more than ok. It’s marvelous. I like my cupcakes delicious, plentiful, and easily accessible, so the abundance of cupcakes shops in this city works well for me. Perhaps the most famous cupcake hot spot in the neighborhood is Magnolia Bakery, which is about two blocks from my apartment, but it’s almost always packed and sometimes, when people are feeling especially batty, there’s even a line snaking out the door. But when a new place called Doughboy Bake Shop opened up a few months ago, also just a couple of blocks away, and they turned out to have really fantastic cupcakes, I was all about them. On a recent lazy Saturday, I decided what I needed to put some pep in my step was a bit of caffeine…and hell, why not, a cupcake to go with it. First of all, a note on their coffee: it’s from Mud, which if you’re in New York, and you like coffee, you should have this coffee. It’s pretty phenomenal. As for the cupcakes, I’d had them before and they were always great, moist, fluffy with lots of icing. On this particular weekend I went with an Oreo cupcake, which with it’s tall, fat swirl of creamy frosting and whole Oreo on top already looked intense, but little did I know just how serious it would be. I took it home so we could have some privacy (i.e. so I could unhinge my jaw like a python and practically swallow it whole) and as I was peeling off the baking wrap from the bottom, I discovered something awesome. Baked at the very bottom of the cupcake was…wait for it, waaaiiit for it… BAM! an entire Oreo. Just sitting there, waiting like the delicious little surprise that it was. 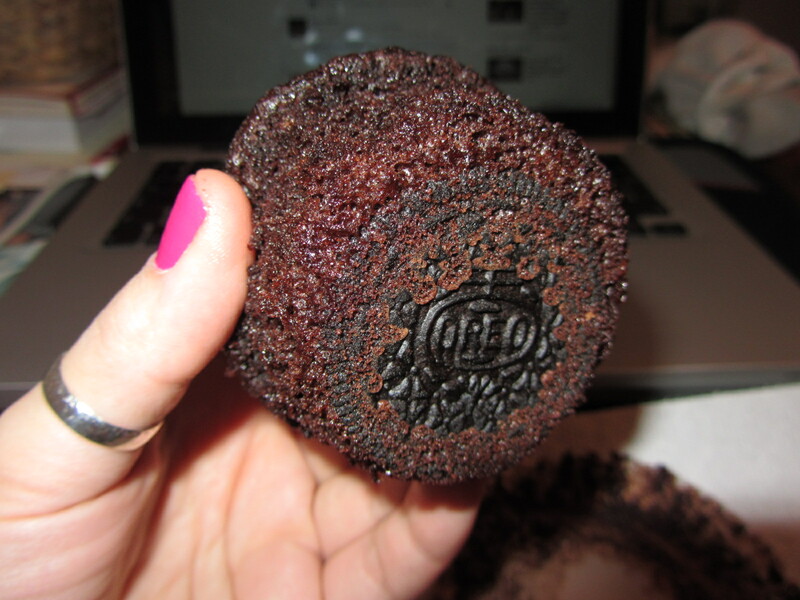 I’ve had plenty of Oreo cupcakes, some with Oreo crumbles, others with chunks, but never an entire Oreo inside the cupcake. A whole Oreo... INSIDE the cupcake. My kind of surprise. 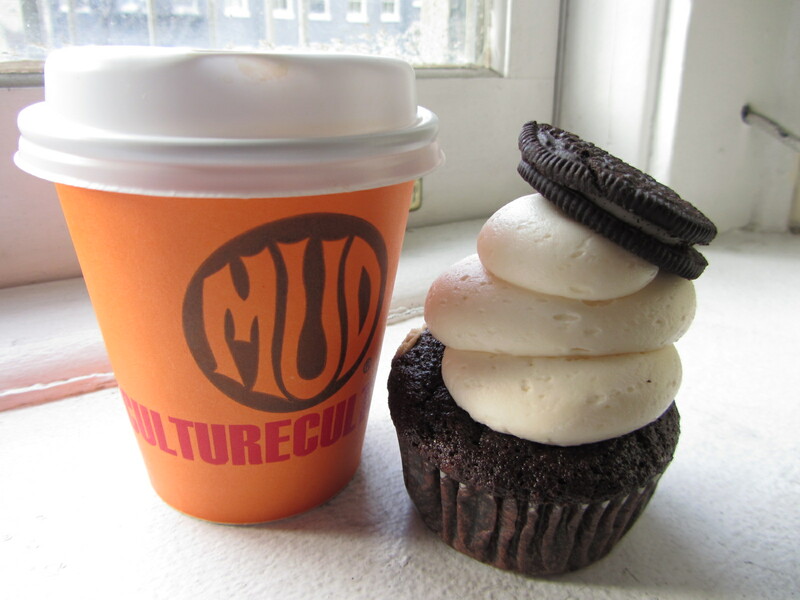 I love that there are cupcakes everywhere in this city, but I especially enjoy that one of my new favorites is so dangerously close to my place, and that inside some of their delicious cupcakes are ENTIRE freakin’ Oreos waiting to be eaten! This entry was posted in Sweet stuff and tagged cupcakes, Doughboy Bake Shop, Mud coffee, Oreo, West Village. Bookmark the permalink.